The Quebec government’s Ethics & Religious Culture (ERC) course is a point of contention in two ongoing court cases – one involving a high school, and the other a family. Litigation about whether a Quebec private school can teach the ERC from a Catholic perspective recently entered a new stage. Late last month, the Quebec Appeals Court agreed to deliberate the judgment rendered by Superior Court Justice Gérard Dugré. 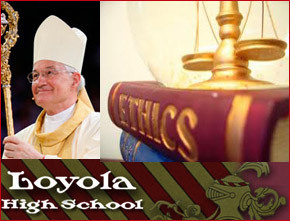 His 63-page judgment, issued June 18, ruled in favor of Loyola High School, stating that the private Catholic boys school has the right to continue teaching ERC from a Catholic perspective. “The obligation imposed on Loyola to teach the ethics and religious-culture course in a lay fashion assumes a totalitarian character essentially equivalent to Galileo’s being ordered by the Inquisition to deny the Copernican universe,” wrote the judge. Premier Jean Charest announced the following Monday, June 21, that the government would appeal. Loyola’s principal, Paul Donovan, says the appeal date is at least five months away. The court allows the appellant three months to submit its factum. Subsequently, Loyola’s lawyers will have two months to file their reply. In a related case, a Drummondville couple, Suzanne Lavallée and Daniel Jutras, would like their children exempt from the ERC course in their public school. Their appeal to the Quebec Appeals Court was denied in February. At the end of April, their lawyers followed up with an application for leave to appeal to the Supreme Court of Canada. A response about whether the Supreme Court will hear arguments is expected this fall. Both Loyola and the Drummondville couple are represented by Borden Ladner Gervais. When classes began at Loyola High School last month, it was business as usual, thanks to a Quebec Superior Court ruling, which states that the private Catholic boys school could carry on as usual with its Catholic religion and ethics courses. Justice Gérard Dugré issued his decision during the last week of the 2009-2010 academic year, granting the school a legal exemption from teaching the government’s ERC course. The June 18 ruling was one year in the making; the case was heard June 8-12, 2009. The Quebec government appealed the ruling, and the Quebec Appeals Court issued its decision September 27 to hear the appeal. Loyola took Quebec’s minister of education to court, after the minister refused the school’s request to teach the ERC course from a Catholic perspective. The ERC curriculum insists that the teaching of different religions and ethical issues be done from a “neutral” stance. Teachers are not allowed to infer that one religion or ethical position is superior or truer than another. The Jesuit school supports the teaching of different religions; students have been required to take a mandatory world religions course for the past 10 years. However, Loyola took issue with the methodology of the ERC curriculum.